The standard large destroyer available to Earth at the outset of the Earth-Minbari war, the Nova was a poor match against Earth’s adversary. Armed with a bewildering array of pulse cannon, the Nova certainly looks menacing. Its greatest asset, however, was its hull construction. 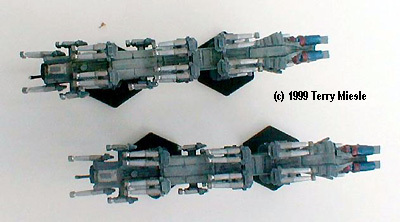 The tough hull formed the basis for the newer Omega Destroyer, which added the weapons systems from the Hyperion cruiser. The Nova also carries two squadron of fighters, a welcome addition to the fleet defense. 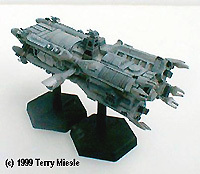 This mini has eighteen big gun turrets, a one-piece hull (beautifully cast), two engine halves and two stands. The guns gave me a bit of trouble, I wound up cutting off the side posts, because they don’t fit on the mini without doing so. I also reshaped the turret block, as well – angling off the back. Once done, I think they look great. The engine halves were a bit miscast, but nothing a file and some filler didn’t take care of. This mini was painted in similar fashion to the Omega Destroyer. A number of other grey paints were used for various panels and regions. I used what I had on hand, I suggest you do the same, just provide some differentiation between sections. The wash is TMM Flat Black, as usual. 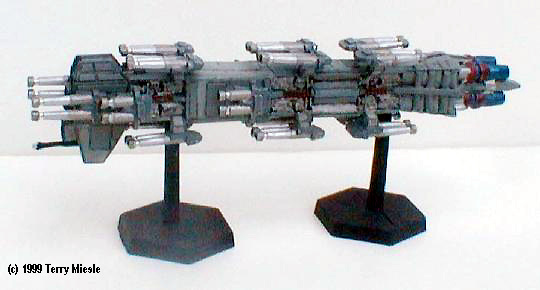 The guns are Testors Acryl (TA) Gunship Grey as the block, followed by TMM Steel, TMM Aluminum, TMM Chrome (smallest diameter), TMM Aluminum on the end, and a dot of TMM Flat Black for the aperature. I like this mini a LOT! It’s a real beast, and well overdue for release. It is a fair amount of work, but well worth the effort. 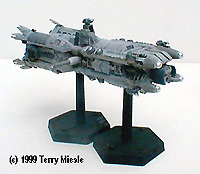 A smaller capital ship, the Olympus was well outdated by the time period of the Babylon 5 series. It remains in service as an electronic warfare platform, though the remaining vessels will be withdrawn by the time the new Warlock Class Cruisers enter service. The mini consists of two crisply cast fuselage halves, six small gun turrets (one is a spare), four thruster vanes, and two stands. The vanes required a bit of cleanup, and the bottom fuselage half had pretty deeply engraved identifying and copyright markings, which I filled with putty. The fit is very good, no complaints there. 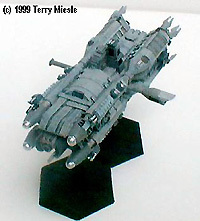 Again, plenty of grey shades, washes and drybrushing is required to make Earthforce designs. I experimented with some blue coloring, but never found anything which looked right. I would like to add some markings, but until I figure out where they would go, I'll leave it plain. 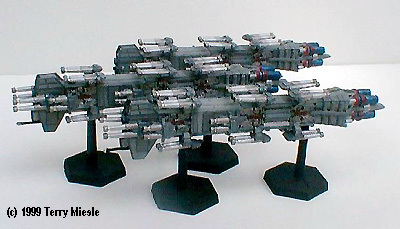 This is a very attractive design, and would make an outstanding scratchbuild subject for anyone willing to try. 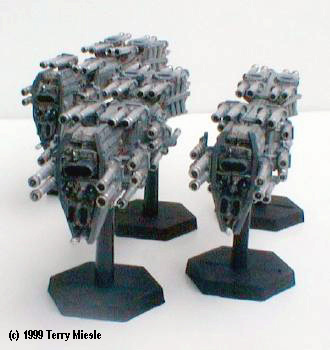 The mini is a good reference for that, as are all the AOG minis. This is an easy build, and a good first-time build for EA minis.